In literal terms, “enoteca” is Italian for “wine shop.” In the old country, it served as a hub of wine activity—a place winemakers could store their product, where both travelers and locals could gather to taste and learn about and purchase locally produced wines. Hence, the multitude of "enotechi" that dotted the Italian landscape—and still do. Enoteca La Storia, in the tradition of a classic Italian wine shop, is a gathering spot for sharing and savoring fine wines, craft beer and the company of friends and family. Enoteca La Storia is the result of a unique vision that two longtime friends and Italian Americans, Joe Cannistraci and Michael Guerra, had for creating a relaxing and inviting environment for people to enjoy fine wine, traditional Italian food and lively conversation. Drawing on their shared cultural heritage and family traditions, the concept of an Enoteca was a natural fit as their vision for a business took shape. Enoteca La Storia focuses strongly on the wonderful characteristics of Italian and domestic wines, but also pays homage to the rest of the international spectrum, including wines from France, Spain, Germany and the Southern Hemisphere. Enoteca La Storia is a place to create your own “wine story,” whether simply enjoying your favorite wine again and again, or sampling and learning about new wines from around the world. The Enoteca La Storia team has a common goal: to help you enjoy your experience, whether you are a wine aficionado or simply looking to relax and savor something delicious. Our staff is knowledgeable about wine, eager to please, and embodies the hospitality of the Italian culture that Enoteca La Storia is built upon. 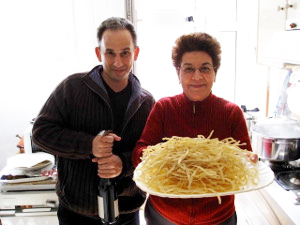 Joe ('Joey C'), seen here with his cousin (Yolanda Ganji-Chiodo) in Petralia Sottana, is co-owner and architect behind Enoteca La Storia's success as an authentic Italian eatery and purveyor of fine wines. 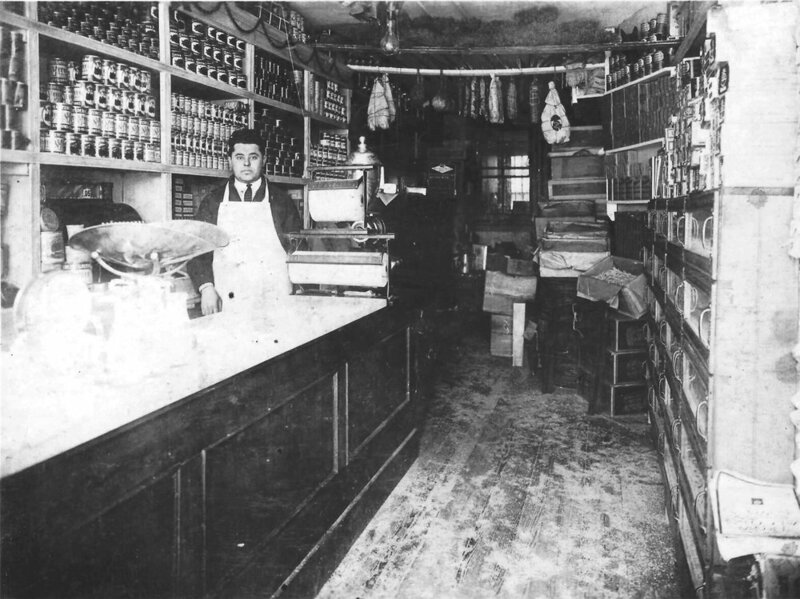 Born in New York and raised in Northern New Jersey, Joe’s “100% Sicilian” roots took hold in the U.S. shortly after World War I. Joe's paternal grandfather, Lorenzo, Great-Grandfather Andrea, and Great Uncle Carmelo, ran a successful Italian grocery store on New York City’s lower East Side for many years. Equally influential on Joe was his relationship with his maternal grandfather, Calogero Bellina, who taught Joe the purest and most enduring southern Italian sensibilities. To this day, Joe travels back to the hometown of his ancestors in Sicily to spend time with his cousins, cooking, eating, and of course, drinking good wine. It is this authentic Italian heritage, still very much alive in Joe’s life, which he draws on to provide guests a truly unforgettable Italian experience at Enoteca La Storia. Joe's personal career in wine and food materialized when he moved to California—mainly for a respite from East Coast winters—in 1999. After landing in Aptos, Joe found himself able to simultaneously pursue two passions: surfing and wine. A year after relocating, a childhood friend, accomplished chef and consultant with the Blue Ribbon Restaurant Group, Sefton Stallard, visited Joe and introduced him to Sean Saint'Amor, wine and service director for the Blue Ribbon Group. After a brief immersion into the world of fine global wines, Joe took a part-time job at The Wine Club Santa Clara - the premiere wine shop in the Santa Clara Valley. Demonstrating a natural aptitude and passion for wine, Joe was promoted to full-time Italian wine buyer and assistant manager in just 18 months. He eventually left to become a founding manager of Vintage Wine Merchants in Santana Row. Through his outgoing personality and enthusiastic dedication to removing the mystery from Italian wines, Joe quickly developed a devoted following of customers who came to trust his knowledge and recommendations. 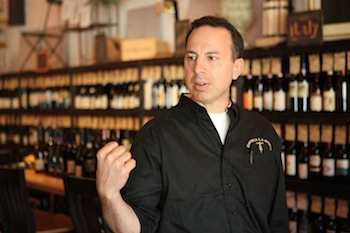 Ever the entrepreneur, Joe partnered with friend and colleague Michael Guerra to found Enoteca La Storia in April 2010. Just one year later, Enoteca La Storia was named Best Wine Bar in Silicon Valley (San Jose Mercury News). Joe resides in Los Gatos with his family. He can be found most days at Enoteca La Storia running the show, forming rich relationships with artisanal wine-makers and sharing his knowledge about Italian—as well as international and West Coast—wines, food and culture with the Enoteca famiglia. Curious about what best to pair with an obscure Nero d'Avola from Sicily? An avid fan of Riojas and seeking a rare label or great bargain? Or a Rombauer Chardonnay drinker, but thinking about expanding your palate? Talk to Michael Guerra. Michael “Mike” Guerra is co-owner and wine 'négociant' of Enoteca La Storia, and oversees the selection of all retail, by-the-glass, and club wines. Mike, who is 100% Calabrese, and a third-generation San Jose native, comes from a family rich in tradition and history in the food, wine and hospitality business. For more than thirty years, Mike's paternal great-grandfather, Joe Guerra, owned and operated a grocery store in San Jose. On Mike’s maternal side, a passion for food sales and service prevailed as well. Mike's maternal grandparents (Fortino) owned and operated Villa Pace, in Hollister, California. Villa Pace was a landmark Italian restaurant still fondly remembered for the quality of its authentic Italian food and unparalleled hospitality. Family connections aside, Mike's transition into wine was not a traditional one. While attending Santa Clara University, Mike traveled abroad to study for one year in Rome, Italy—a trip that he claims ignited his passion for wine. It wasn't until years later, however, that Mike made his passion his career. First, Mike earned a Master’s Degree in Social Welfare from UC Berkeley, and, after completing a post-Master's Clinical Fellowship at the Yale University Child Study Center in New Haven, Connecticut, he moved back to the Berkeley area when he accepted a position working as a Mental Health Clinician for the Solano County Mental Health Department. During this time, Mike took several wine courses through UC Berkeley Extension and frequented many of the specialty wine shops in the area, including Kermit Lynch Wine Merchant. It wasn't until after working as a socialworker from 1992 to 1999 that Mike decided to officially pursue his interest in wine by taking a sales position at The Wine Club Santa Clara, the premiere wine shop of its time, in the Santa Clara Valley. Mike next took a sales position at K & L Wine Merchants in Redwood City, where he ended up serving as the Assistant Italian Wine Buyer. Eventually, Mike was approached by investors to help found Vintage Wine Merchants in San Jose. Mike’s knowledge of international and domestic wines, and understanding of Italian and other cuisines, informs his work in a variety of wine endeavors: developing food pairing programs, organizing and leading wine education events, and managing private and corporate tasting functions. Mike has been featured in articles in the San Jose Business Journal and San Jose Magazine and interviewed for segments on "In Wine Country," and two different episodes on KRON-TV. In particular, Mike is intrigued by the classic wine regions of Europe, and he shares this sincere desire to expand customer's awareness and exposure to lesser-known, international varietals and labels in his work at Enoteca La Storia. But even more importantly, Michael is known among customers for his low-key, approachable attitude about wine. Mike is excited and proud to revive and carry forward family and cultural traditions by combining his "old world" sensibilities with his education and wine industry experience to create a casual, unique and authentic place for people to gather and enjoy interesting wine, delicious food and lively conversation.